Choosing the perfect web hosting company for your website is not easy. With a multitude of companies such as InMotion Hosting, Bluehost and SiteGround offering features such as 99% uptime, great resources, and of course, unlimited data, trying to pick a web hosting company is akin to choosing a marriage partner! If you need some help navigating through the technical jargon and subscription plans, then read up on this guide for the things that you need to look into before choosing a hosting company for your business or blog. Shared Hosting: Shared hosting is often the best choice for small websites and personal projects such as blogs and online portfolios and is often paired with popular CMSs such as WordPress. The trouble with shared hosting is that you have limited bandwidth and storage as you have to share your server resources. However, it is the cheapest option if you don’t want to spend too much on hosting. Dedicated Hosting: Those with bigger budgets and can afford their own web server should go for dedicated server hosting. It’s definitely the most expensive plan but they provide excellent performance capabilities. If you’re looking to host a large online store or forum, then you might want to consider dedicated hosting server plans. Virtual Private Server Hosting (VPS): Sitting in between a shared and dedicated server hosting is VPS hosting. The technology behind VPS hosting is analogous to that of VMware or Virtual Box. They are cheaper than a dedicated server plan but offer more storage space and bandwidth than a shared server hosting. Cloud Hosting: Another hosting plan that sits between shared and dedicated hosting is cloud hosting. The major difference between VPS and cloud hosting is that a cloud hosting plan offers more flexibility when it comes to upgrading or downgrading a plan. There are things to take note when upgrading to Cloud Hosting. It’s a good idea to have an understanding of all the different web hosting plans and how they work before trying to create an awesome looking website. Pricing is probably the aspect that most of us often consider first before choosing a hosting provider, so it’s often a good idea to check how much different companies will charge for their plans before deciding on one. But here’s the thing, while pricing is important, it shouldn’t be the deciding factor. Just because you see a cheap plan, doesn’t mean it’s the best option. Since you’re going to be making money off your site, it pays to be aware of the drawbacks of a cheaper option. A company that offers $1.99 for hosting might not offer as much feature and quality as one that’s pricier. We recommend you research on what the features that a hosting company has to offer and their pricing before deciding. An important factor that every online business needs to consider is the web hosting company’s ability to keep your website online. Having your website down for even a few seconds can lead to huge losses and potential sales. So, it’s very important that the web host you choose operates on a powerful server with good hardware to provide you stable network connections. We recommend that you go for web hosts that have an uptime score of 99.5% and more. Keep an eye out for anything that scores below 99% as these web hosts are not reliable and should be avoided. A few factors you might want consider is to check whether they have features such as RAID protected storage, daily server backups, and stable bandwidth, to help keep your website online. 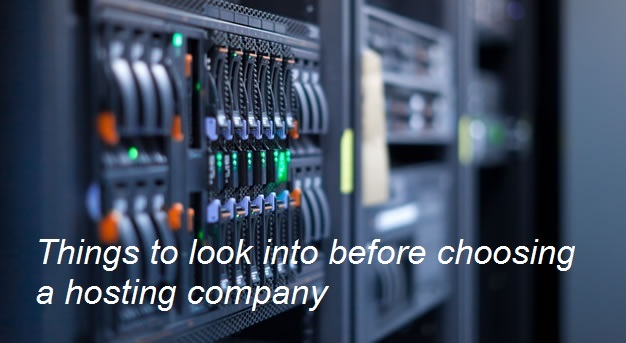 If you’re signed up with a good hosting company, you shouldn’t come across any downtime. However, there will be times when your site goes down due to errors or bad coding. When that time comes, having a good support or tech team will definitely be important. A good sign of a quality hosting company is from the reputation of their customer support. You wouldn’t want to be stuck trying to contact a support team for hours just to figure why your website is down. So, before you sign up with a host, make sure their customer support is available via multiple ways (i.e. phone, email, chat, etc.) and that they are available 24/7. It’s important to understand that not all hosts are equal when it comes to customer support. Some will take pride in their ability to provide customer support, while some will see it as just an afterthought. Make sure you don’t go with the latter. You might have come across the term “Unlimited Hosting” during your research for a hosting company. For the uninitiated, unlimited hosting is the idea that a hosting company is capable of providing unlimited disk storage, bandwidth, and even domain name addon capacity and they offer it at super affordable prices (some as low as $10/mo)! But here’s the thing, in the world of web hosting, unlimited doesn’t necessarily mean unlimited. In truth, what you’re getting is unlimited hosting with certain caveats. WHSR did an awesome article that uncovers the truth behind the unlimited web hosting, which you should definitely read. Bottom line, there is no real “unlimited hosting” available, at least not right now. So, before you jump with joy for the chance of unlimited hosting, make sure you check what that really entails. The last important factor that you need to consider before settling on a web hosting company (and their hosting plans) is whether or not they can still fit and keep up with your site’s growth. Your current hosting plans might be adequate for now but that might not be the case two years later. If your site starts getting more traffic and you introduce more items to sell on your online store, then you’re going to need better hosting servers. A good web-based enterprise should be planning for growth and the hosting plan should be able to accommodate it. Is it easy to upgrade your account? Do they offer VPS or dedicated server solutions? These are some of the questions that you should ask yourself when you look for a hosting company. It’s better to upgrade to the same hosting company than it is to migrate to a new hosting company as it will take plenty of time and effort on your part. Best to avoid it all and sign up with a company that allows scalability and flexibility to grow. With this guide, hopefully, you’ll have a better understanding of what things you need to consider when it comes to choosing a hosting company for your business. Are there other aspects that we didn’t think of? If you are looking for the multi-purpose WordPress theme, we got you covered!